How do you define a terrible team? No, this isn’t going to be a joke about Notre Dame foolishly thinking it could match up against a team from the Southeastern Conference in college football’s national title game (though the Irish win the contest for prettiest make-believe girlfriends). I’m asking the question because a winless record is usually a good indication of a team that doesn’t know what it’s doing and is in over its head. With that in mind, and given the White House’s position that class warfare taxation is good fiscal policy, how should we interpret a recent publication from the Tax Foundation, which reviews the academic research on taxes and growth and doesn’t find a single study supporting the notion that higher tax rates are good for prosperity. 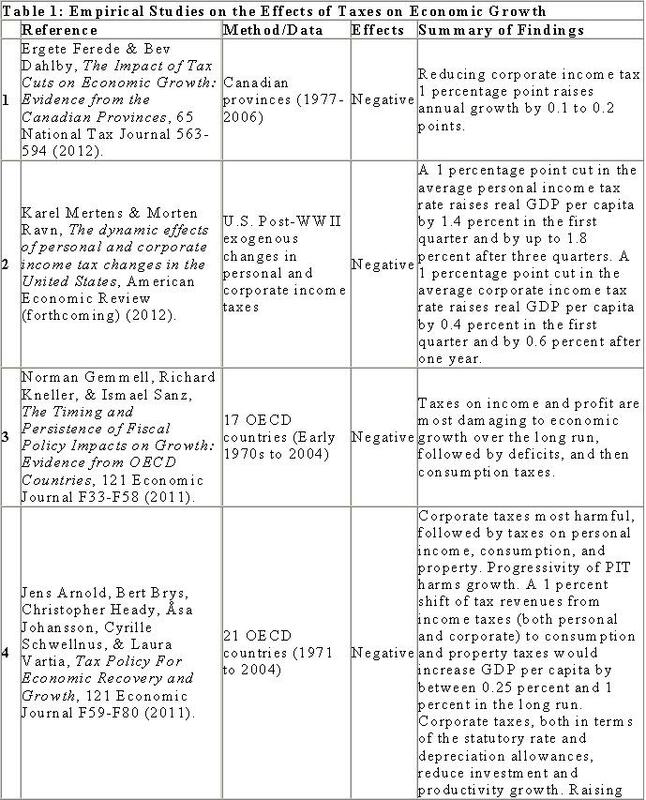 Twenty-three studies found a negative relationship between taxes and growth, by contrast, while three studies didn’t find any relationship. For those keeping score at home, that’s a score of 0-23-3 for the view espoused by the Obama Administration. So what do we find in the Tax Foundation report? 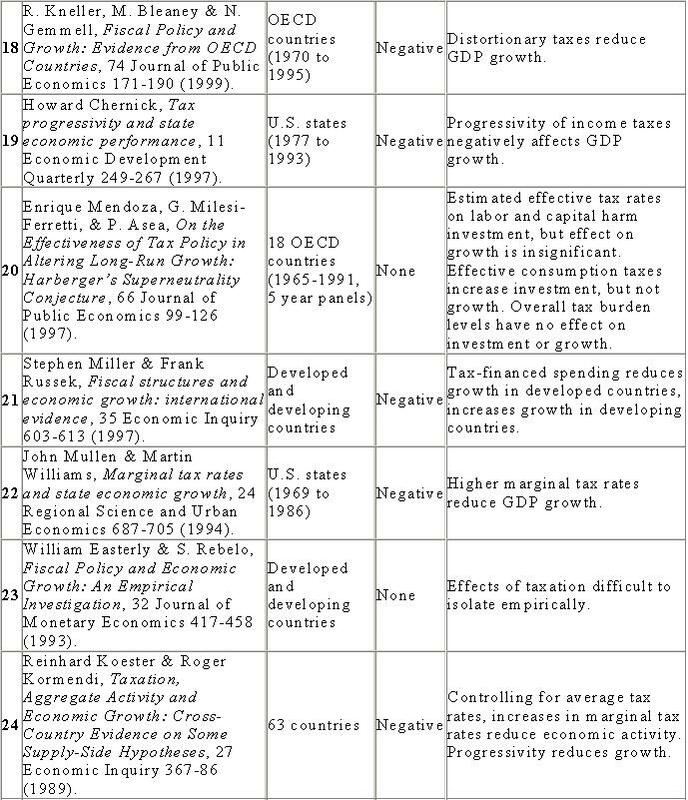 …what does the academic literature say about the empirical relationship between taxes and economic growth? 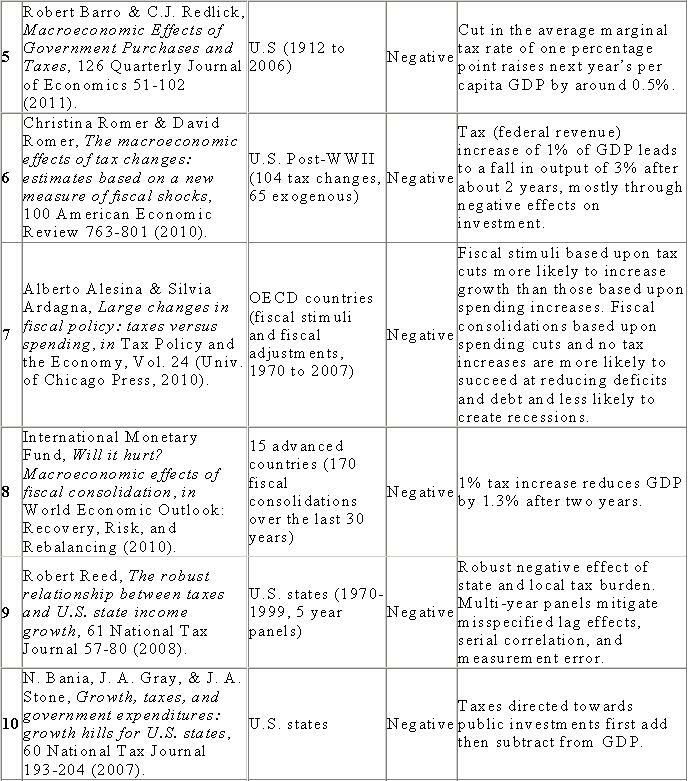 While there are a variety of methods and data sources, the results consistently point to significant negative effects of taxes on economic growth even after controlling for various other factors such as government spending, business cycle conditions, and monetary policy. 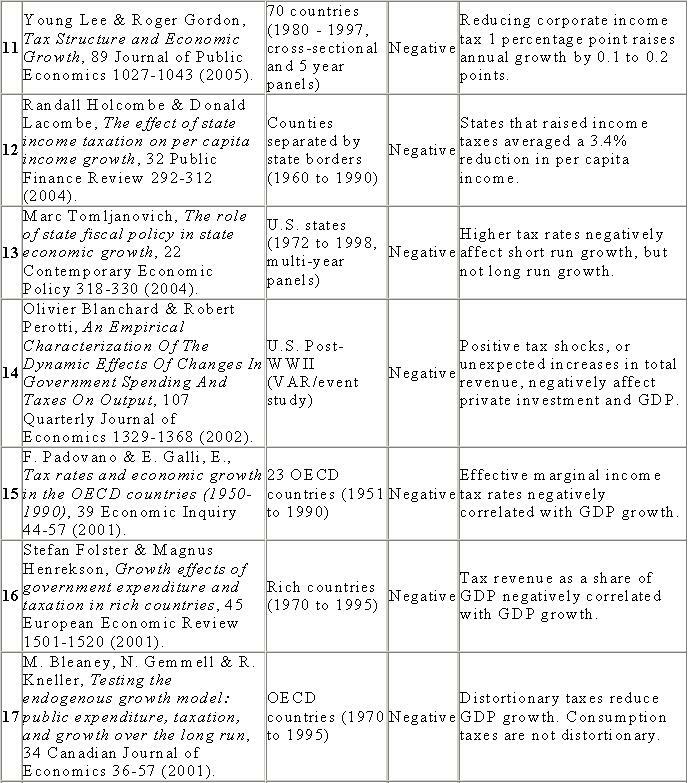 In this review of the literature, I find twenty-six such studies going back to 1983, and all but three of those studies, and every study in the last fifteen years, find a negative effect of taxes on growth. …results support the Neo-classical view that income and wealth must first be produced and then consumed, meaning that taxes on the factors of production, i.e., capital and labor, are particularly disruptive of wealth creation. Corporate and shareholder taxes reduce the incentive to invest and to build capital. Less investment means fewer productive workers and correspondingly lower wages. Taxes on income and wages reduce the incentive to work. Progressive income taxes, where higher income is taxed at higher rates, reduce the returns to education, since high incomes are associated with high levels of education, and so reduce the incentive to build human capital. Progressive taxation also reduces investment, risk taking, and entrepreneurial activity since a disproportionately large share of these activities is done by high income earners. To be blunt, the report’s findings suggest the Obama White House is clueless about tax policy. …there are not a lot of dissenting opinions coming from peer-reviewed academic journals. More and more, the consensus among experts is that taxes on corporate and personal income are particularly harmful to economic growth… This is because economic growth ultimately comes from production, innovation, and risk-taking. Here’s my cut-and-paste copy of the table summarizing all the academic research. So what’s the bottom line? The Tax Foundation report concludes with the following. In other words, America would be more prosperous with a simple and fair system such as the flat tax. Too bad the political elite is more focused on maintaining (or even exacerbating) a corrupt status quo, even if it means less prosperity for the nation. I’ve shared several satirical signs, posters, videos, and bumper stickers on the topic of gun control, but surprisingly few political cartoons. If my aging memory is correct, I’ve only posted a couple of Chuck Asay cartoons on concealed carry (here and here) and one Steve Kelley cartoon mocking the leftist tendency to focus on inanimate objects when a bad guy uses a gun. So it’s time to correct this oversight. 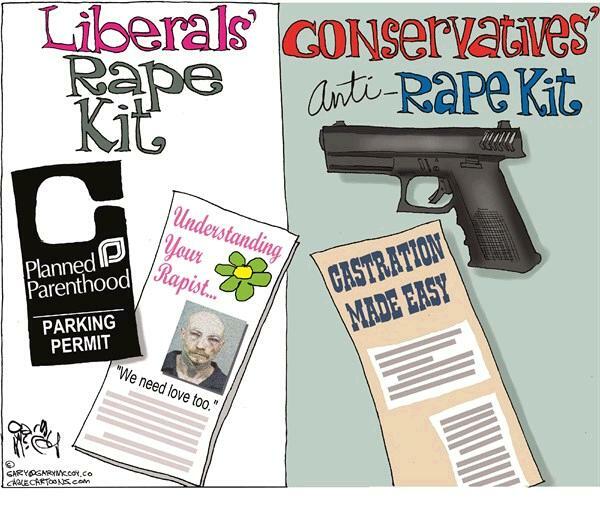 Let’s start with this comparison of liberals and conservatives. As you can see, it’s sort of what you get when you mix this joke with this poster. No wonder liberals and conservatives are contemplating divorce. 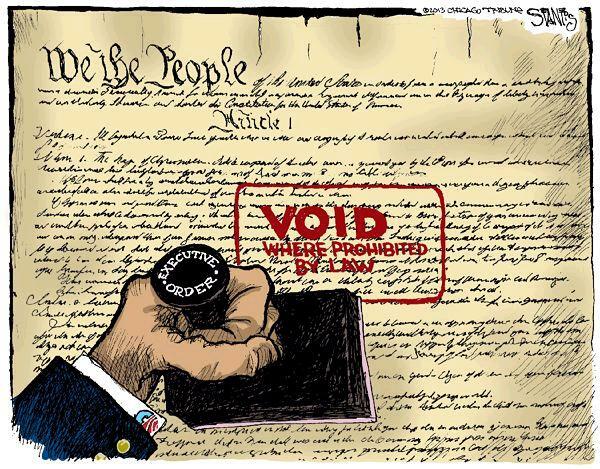 And with Obama proposing a bunch of executive orders on guns, this Scott Stantis cartoon is very timely. After all, who cares about the Constitution and the democratic process! And here’s a cartoon with the same theme found in this poster. 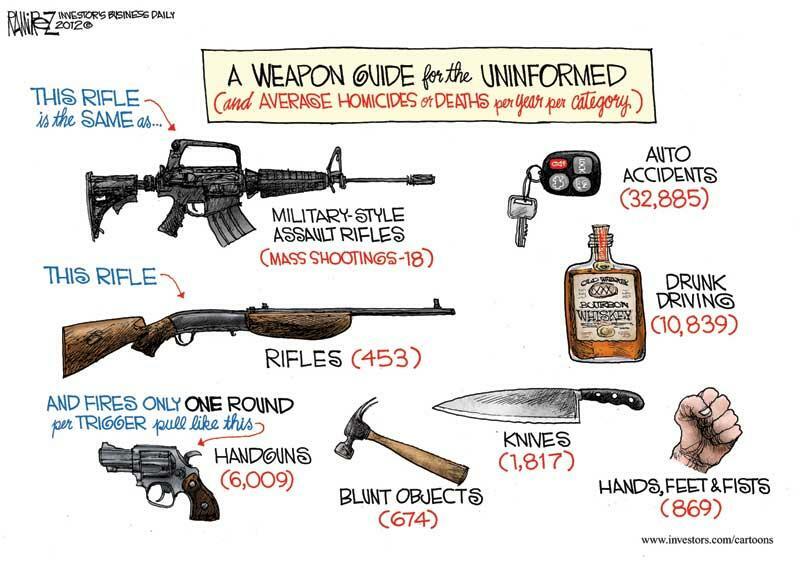 Now let’s shift to a couple of cartoons that look at causes of death, starting with one from Michael Ramirez that shows that so-called “assault rifles” are a statistical asterisk (and no more dangerous than other types of guns). And here’s a specific comparison for 2011. 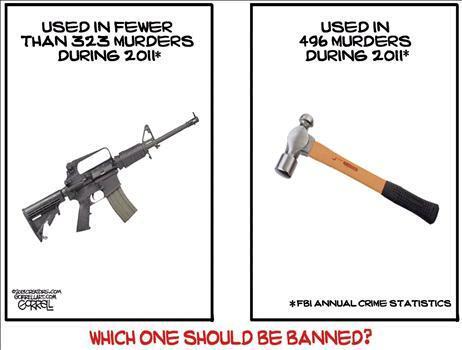 Obviously we need hammer control. While all these cartoons are amusing, the attack on our Second Amendment rights is not funny. In my poll on protecting the right to keep and bear arms, a plurality of respondents said the Second Amendment was worth preserving so people had some ability to resist tyranny. I personally think that the risk of societal breakdown is a more pressing concern, as I explained in this interview on NRA TV. But all that really matters is that we all agree that freedom is worth defending. So let’s close with this inspirational powerpoint presentation on the Second Amendment.